So you want to know a little bit about me, huh? While I would like to say there is an exciting tale to be told, I’m your average American male in his early 30’s that goes to work and does his best to provide for his family. Speaking of family, I’m married to an outstanding woman and we have two fantastic (most of the time) children. 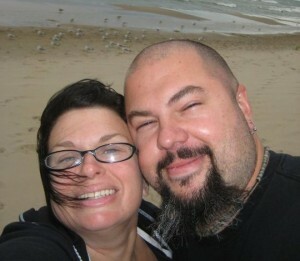 That picture to the right is of me and my beautiful wife along the beaches of Lake Michigan. Once you get to know me, you will come to realize just about every picture of me involves my eyes being closed. Now, at first glance you might think I am a little scary – many people do, could be the shaved head, earrings, tattoos, and long, scraggly goatee – but once you scratch the surface you will see that I am anything but scary. One thing that drives me is being able to help other people, particularly with their technical challenges. I take a great deal of pride in my work and am dedicated to providing the best service possible. 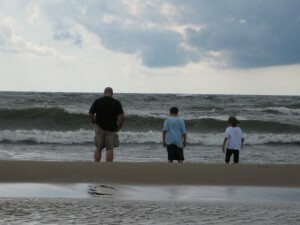 The goal that I carry every day is to act in a manner that is a positive role model to my two boys. In an effort to provide a good life for my family, it should come as no surprise that one of my passions is personal finance and money management. I’d have to say that I am self-educated in the area of money and finance but it is something that I spend a considerable amount of time reading and writing about over at My New Choice. This blog was really meant as a vehicle to allow me to connect with all of you and talk about the things that are important in my life. 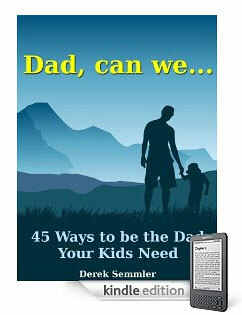 As such, you will often see a good mix of technology / blog related posts mixed in with life events – such as the release of my book on fatherhood. I’ve been a software engineer by profession for many years, although have since moved into a management role where I don’t get to write code anymore. But being a code monkey is at my core, so I use this blog to help people with their technical issues and questions. My family comes first in my life, although I find it a constant struggle to make sure that I don’t allow work to jump ahead. Ultimately, my goal is to leave the corporate rat race and be in a position to provide guidance and assistance to people pursuing their goals, helping them hurdle the roadblocks I once stumbled upon myself. Outside of family and interests with technology and finances, something I find completely enticing is speed. Unfortunately this doesn’t mesh well with being a family man concerned about sending my kids to college, as it is an expensive interest. As of right now, the speed tools that I have at my disposal are a 2006 Scion tC and a 2002 Harley Softail and I absolutely love both of them. That’s about all I have to tell you right now. If you’re interested in anything else, feel free to drop me a line.